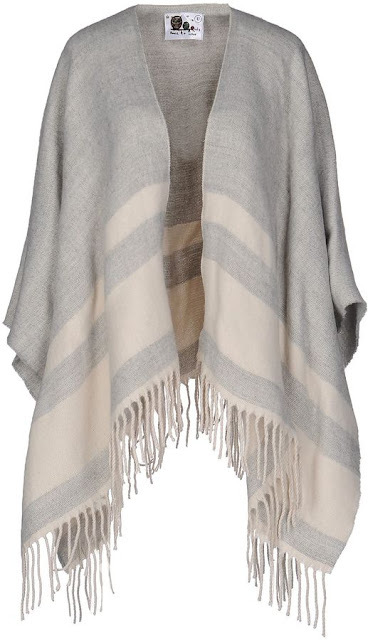 A cape is one of the easiest pieces you can add to your wardrobe. It's so comfy and cozy and it adds a touch of "chic" to any outfit. I wear my capes all the time in the colder months, whether it be with jeans and boots, over a sweater dress or even on top of a leather jacket when I need a bit more warmth. Here are five beautiful capes, all under $50.00. You don't have to break the bank to look super stylish! Oh, and the best part is they're "one size fits all!". This plaid cape reminds me a bit of the one I wore in photoshoot last fall (photo below). Love the rich colors and it's just $24.00! Find it HERE. Love that this cape has a toggle closure so it stays put! It only looks expensive at just $27.99! Find it HERE. The colors in this flannel cape are just amazing! 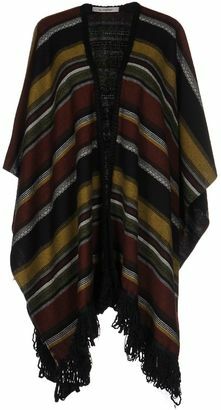 This cape would look fabulous with jeans and camel or brown riding boots. Love the light blue stripe! Just $30.00. Find it HERE. Love the capes! They hide a multitude of sins. Have a good week. I love a great plaid cape! These look great!